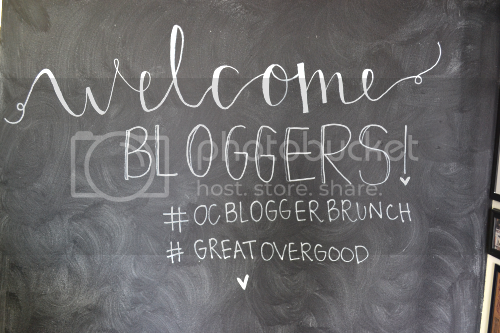 A Simple + Natural Life: blogger brunch! So I actually woke up early on a Saturday morning, and do you know what I did? Went to brunch! Search for it on Twitter! Paper straws in little cups! I had orange juice in mine, and I believe there were mimosas there? All of the clothes that were donated! 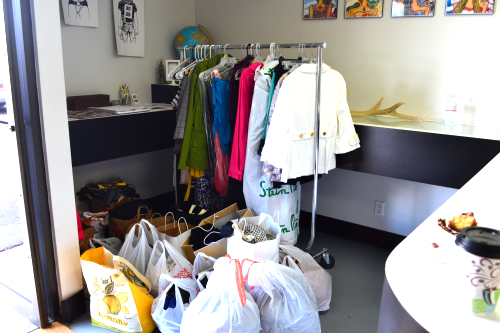 I was so happy to be giving some of my clothes I never touch in my closet a good home! Including a few formal gowns I don't prefer for the birthday balls (don't worry mom, they weren't the ones you gave me!). Now- the spring cleaning continues! This was a great start though! Excited to hopefully have a clean home by summer and the end of finals! Back in my office... One of our little trinkets from the event! The card was a gift from Nadine who owns Great Over Good. My craft! Can't wait to try this! So much fun!! It was a great experience and I was so glad to be able to make it to this event! They are planning on having one each month - next month will also be hosted by Bloggers Giving Back and we'll be making care packages to send to troops overseas. I believe it's March 29th, so other socal bloggers...Check out the website (button below) for details! I'm sure the space will fill up fast since it is limited! Hey girl! I was there too and it was such a fun event to get to know more bloggers! Hope the rest of your weekend went well!